The course has an out and back layout with many of the golf holes playing past a series of lakes, and strategically placed creeks. Long, straight driving is required to negotiate the often narrow fairways. The large trees at Siam Country Club often get in the way and will punish errant tee shots. It is not uncommon to find an otherwise good drive actually nestled under a bed of pine needles or a shaded canopy of huge trees hanging over the fairway. 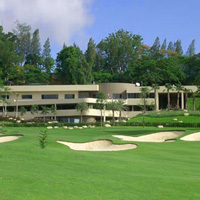 The greens at Siam Country Club are for the most part large, roll fast, and are excellently maintained. Many subtle breaks favor the assistance of an experienced caddie to read properly.